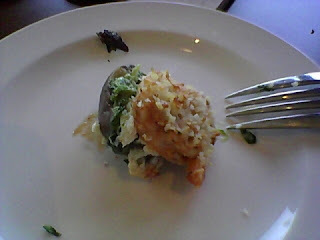 My boss took me to Seasons 52 today for lunch. It was an employee appreciation lunch, so I made sure I picked somewhere nice! I thought the concept was interesting, so I have been eager to try it. For those who don't know, Seasons 52 is a restaurant that offers seasonal menus with fresh ingredients and promises that all dishes are under 475 calories. I was skeptical at first. Most of the restaurants that offer low calorie items achieve this by offering small portions or swapping out the side item for veggies. Not Seasons 52. Our waitress told us that they try to bring out the flavor in the food instead of using butter...as a matter of fact, they don't even have butter in the restaurant! We were seated in the Carneros room at the front of the restaurant. The room reminded me of a Florida sunroom and was very open and had lots of natural light from the wall of windows. We checked out the menu and thought we were ready to order, until we saw the flatbreads at the table next to us. They looked great so we decided to get 2 flatbreads and an appetizer to share. Our appetizer was the Caramelized Crab & Shrimp Stuffed Mushrooms with roasted garlic and Parmesan cheese. I was really excited to try this because I would never get to order it normally. Ivan hates mushrooms, so I was glad that I was with the boss! We both really enjoyed this appetizer. The mushroom was on the bottom stuffed with crab, and had 2 shrimp on the top covered with bread crumbs. They were big enough that you had to cut them in half to eat. My boss tried to eat one whole and said that it was better that way, but my mouth is too small for that so I stuck with the knife! We decided on the Spicy Chipotle Shrimp Flatbread with grilled pineapple, feta cheese and roasted poblano peppers, and the Spicy Pork Taco which is the flatbread selection on the weekly specials menu. 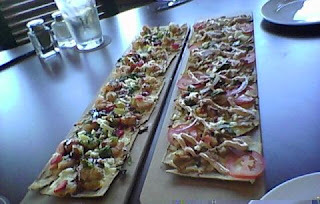 The pork flatbread had pork, tomatoes, red onions, and a spicy chipotle sauce. I don't know which one I liked better! 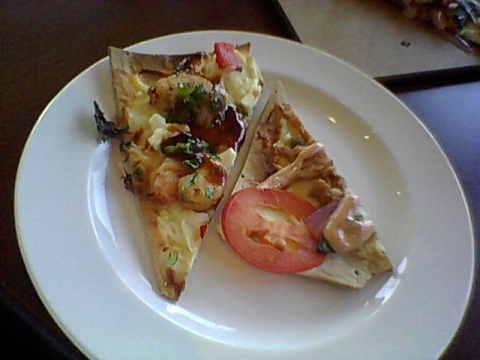 The flatbreads were cracker thin and very crisp. The pork one was very spicy and had generous amounts of toppings. The shrimp one was more sweet than spicy. 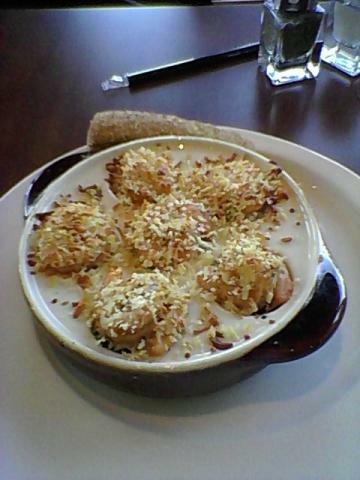 The pineapple gave it that sweetness and really made the shrimp stand out. I couldn't believe how good they both were. Under usual circumstances, I am not a veggie lover. But on the flatbread, it was "anything goes"! We splurged a little bit and got 2 mini desserts each. I got the ﻿Rocky Road and the Chocolate Peanut Butter Mousse. The Rocky Road (on the left) was my favorite. 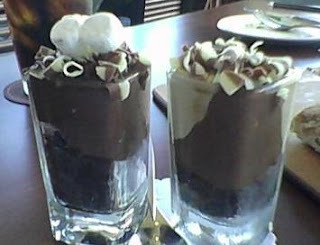 There was a chocolate cake on the bottom and chocolate mousse on the top with chocolate chips and marshmallows mixed in. How could that be bad??? 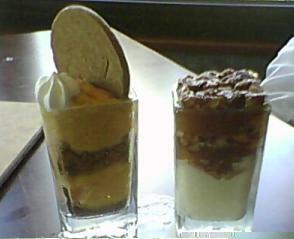 The Chocolate Peanut Butter Mousse (on the right) was light and rich. It had some chocolate cake on the bottom, but most of the top was the peanut butter mousse. Both desserts had chocolate shavings on the top. I liked these because they were big enough to feel like you had dessert, but small enough so you don't feel too guilty about it! Overall I was very impressed with Seasons 52. While eating, we were able to sneak a peek at all of the servers walking by delivering food and everything looked really good. For under 475 calories, the portions looked big and very delicious! I will definitely be back with the hubby to try some different menu items. The menu changes every season, so you can never get bored! Mmmmm this place looks interesting. I thought it was really good. Just know that the dishes run from $10-$20 for lunch (not sure about dinner) but I think it's worth it because everything is fresh and a really good quality. Let me know if you try it!